Be the volunteers for The Institution of Engineers (India) and earn satisfaction of doing public good. You may spread the message and knowledge about The IEI and its activities and how it benefits the member engineers in their professional development, at the place where you work, within your engineering friend-circle and around the area where you reside. You may visit nearby engineering colleges in your district, meet the faculty members and motivate them to join us. You may meet the engineers working with industries in nearby area or within your district and prepare them to be our members. Any corporate member (i.e. member registered with IEI in Associate Member, Member or Fellow Category) bringing in 50 or more fresh corporate members to Gujarat State Centre or any of its Local Canters, IEI before next AGM i.e. before October 2016 shall be felicitated during the Annual Session of Gujarat State Centre and rewarded in cash with Rs. Five thousand. 1. To be eligible to get incentive the member should have been registered in Associate Member, Member or Fellow category only. 2. The members getting enrolled should be for fresh membership only. Members to be taken up under Reinstatement Scheme or Upgradation of membership viz. from AM to M category or M to F or AM to F category shall not be considered eligible for the purpose of counting under this scheme. 3. The scheme shall be applicable for the period from Annual General Meeting held on 31st October 2015 to the next Annual General Meeting to be held in October 2016. Number of members enrolled shall be counted for that period only. 4. Corporate member participating in this scheme shall sign each membership form submitted by him by endorsing the member. Care should be taken to see that all required details are filled up and documents attached. 5. Any Corporate Member, who submits membership forms under this scheme shall be given by the office of the State centre/ Local Centre as the case may bea computer-printed receipt mentioning the names of persons whose applications have been submitted, their grade of membership and the full name, membership grade and number of the corporate member submitting the application. However, issuance of such receipt shall not be considered as qualification for receiving benefits under this scheme. Please see Rules 6 & 7. In case of local centres, their office must submit a copy of such receipt to the State Centre also. The signatory to the receipt has to clearly and legibly mention his full name and designation. 6. In case of such membership forms in which discrepancies are mentioned by the IEI HQ, the State/ Local Centre office should immediately by mail inform the member who has brought in the forms, to get necessary compliance done. 7. 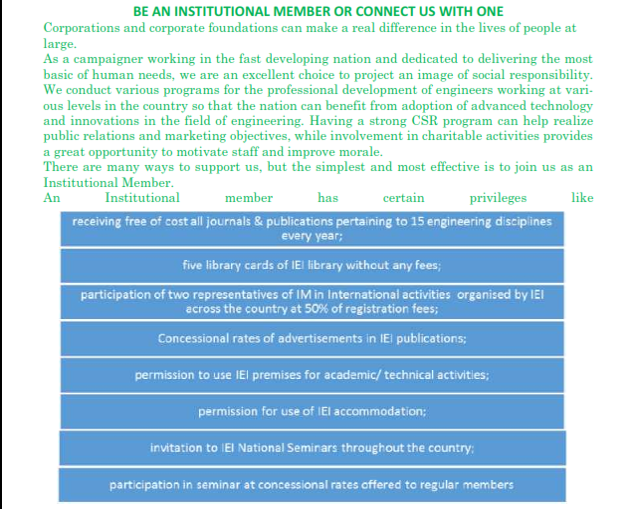 Only the forms which the IEI HQ accepts for the purpose of membership and grants the membership shall be counted for the purpose of this scheme. 8. Member becoming eligible to get incentive under this scheme shall be notified a week before the AGM by mail by Gujarat State Centre. He shall be felicitated during the 57th Annual Session that will be held the same day immediately after the AGM and rewarded cash prize of Rs. 5000/-. No TA/DA would be admissible to attend the Annual Session.